Alston Art Apartments01434 382975work Self-cateringSet in a quiet hidden corner of the medieval cobbled area of Alston, these immaculately presented cottages have been imaginatively developed by the architect owner from original buildings dating from the late 17th Century. They have each been awarded four stars from Visit Britain and the Enjoy England Gold Award for outstanding quality, and were also winners of an Eden District Council 2009 Design Award. The cottages are owner managed and each cottage has its own individual charm and character, incorporating a wealth of attractive features including solid oak floors, exposed beams and many other interesting little details. 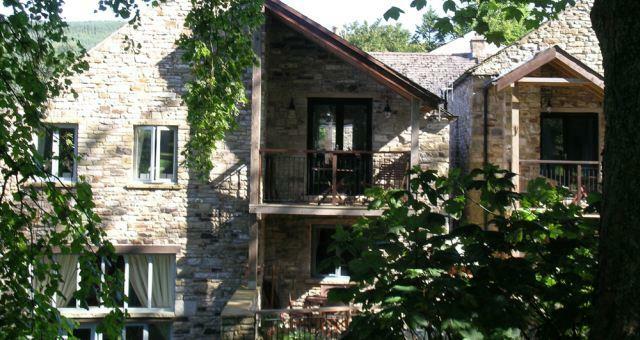 Each cottage has its own external patio area, one with a mill-race flowing through it, and two cottages have first floor living rooms opening out onto private balconies. The cottages are tastefully furnished with a blend of contemporary and country style furnishings to a very high standard, including paintings and prints by artists from our local region, creating the perfect ambience for a relaxing holiday at any time. They have been designed to cater in particular for guests with a creative or activity interest, offering the possibility of longer stays in order to develop creative work or to pursue a particular interest. At the heart of the North Pennines 'Area Of Outstanding Natural Beauty' Alston is an excellent base to explore this relatively undiscovered and unspoilt area, with its natural landscapes, tumbling waterfalls, and wealth of wildlife. Alston is a market town steeped in history with a good range of individual shops, tearooms, art galleries, local crafts, and character inns serving traditional ales and good food. You can forget your car and enjoy many good local walks right on the doorstep, from gentle riverside rambles to challenging hikes across the fells. Local attractions include the South Tynedale Railway and the Hub Museum both run by volunteers, and Nenthead Mines and Killhope lead-mining museums reflecting how the area's geology has shaped its history. At the hub of five routes, it is also an ideal centre for exploring Hadrian's Wall and Northumberland National Park to the North, Durham City (world heritage site) to the east, beautiful Upper Teesdale and the Yorkshire Dales to the south, and the Lake District to the west, all within an hour's drive. Alston Art Apartments offers weekly bookings starting on Saturday. Cottage clean and well presented when we arrived. Owner very nice and gave us good info on where to eat out and about the area. Cottage very nice and equipped to a high standard. Set in a quiet hidden corner of the medieval cobbled area of Alston, these immaculately presented cottages have been imaginatively developed by the architect owner from original buildings dating from the late 17th Century. They have each been awarded four stars from Visit Britain and the Enjoy England Gold Award for outstanding quality, and were also winners of an Eden District Council 2009 Design Award. The cottages are owner managed and each cottage has its own individual charm and character, incorporating a wealth of attractive features including solid oak floors, exposed beams and many other interesting little details. Each cottage has its own external patio area, one with a mill-race flowing through it, and two cottages have first floor living rooms opening out onto private balconies. The cottages are tastefully furnished with a blend of contemporary and country style furnishings to a very high standard, including paintings and prints by artists from our local region, creating the perfect ambience for a relaxing holiday at any time. They have been designed to cater in particular for guests with a creative or activity interest, offering the possibility of longer stays in order to develop creative work or to pursue a particular interest. 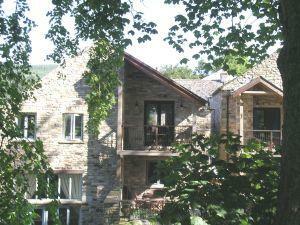 Local facilities, pubs and shops, within 2-5 minutes walk and 5 minutes to open countryside. Children welcome from any age. From the A686 Penrith-Hexham road, which passes through the bottom of the town, turn up the steep cobbled street past the Victorian town hall on your right, and past the parish church on your left. Continue up the street until you arrive at the Market Square where you will see a little stone shelter on pillars know as the Market Cross on your left. Turn sharp left between the Market Cross and Turks Head pub into The Butts, old area of Alston. Go through a narrow opening and diagonally across a small square, then follow the road straight on past a mini cross roads. After the little crossroads there is an arch on your left, you will have already passed an arch on your right. Just after the archway is the cottage reception which overlooks a little flagged parking area. Nearest railway station Penrith, 20 miles. Limited daily bus services from Carlisle, Brampton, Haltwhistle, Monday - Saturday, Hexham Tuesdays only, Penrith and Keswick, summer service only.